Perth by-election 2018: Who do you think will win? The Federal Division of Perth encompasses the central and inner north-eastern suburbs of the Perth suburban area. One of the original electorates created in 1901, the seat was held by the conservative parties pretty reliably until the 1930's. From the 1940's, the seat became more marginal, changing hands fairly regularly. Since the 1980's, the seat has been a reliable retain for the Labor Party. However, in the most recent elections, the seat has become precariously more marginal owing to the changing demographics of the area. Tim Hammond held the seat from the 2016 Federal Election. He announced his retirement on the 2nd of May, citing family reasons. The numbers on the map below represent the two party preferred vote percentages at each polling place at the 2016 Federal Election. Red numbers represent booths that Labor won, blue numbers represent booths the Liberal Party won. The Liberal Party are not endorsing a candidate in the Perth by-election. Julie Matheson is the founder of the Western Australia Party (federally unregistered). Nicole Arielli completed a Bachelor of Science degree in Environmental Management in 2015 and has strong knowledge of the many wildlife and environmental issues within Australia. She is on both the Animal Justice Party WA and Stop Live Export committees, undertaking the role of Treasurer. Jim Grayden is a former high school teacher and has worked in the management of family-owned business interests for the past 20 years. He also has an extensive family history of political representation in Western Australia; most notably his father, Bill Grayden, who is the longest-serving member in WA history having served a total of 43 years in the State and Federal parliaments. He is a former member of the Liberal Party. Born in South Africa, Wesley Du Preez migrated to Australia with his family in 2007. He recently graduated from Edith Cowan University with a Bachelor's Degree in Marketing, Advertising, and Public Relations. Dr Ben Mullings is a Counselling Psychologist with background experience in applying psychotherapy across a diverse range of contexts, including work with veterans, people in the department of justice, couples in crisis, and home-visit services for teenagers. He has also worked as a lecturer and presenter on the topic of ethics, the use of technology and the Internet in psychotherapy, and the complexities of professional practice. 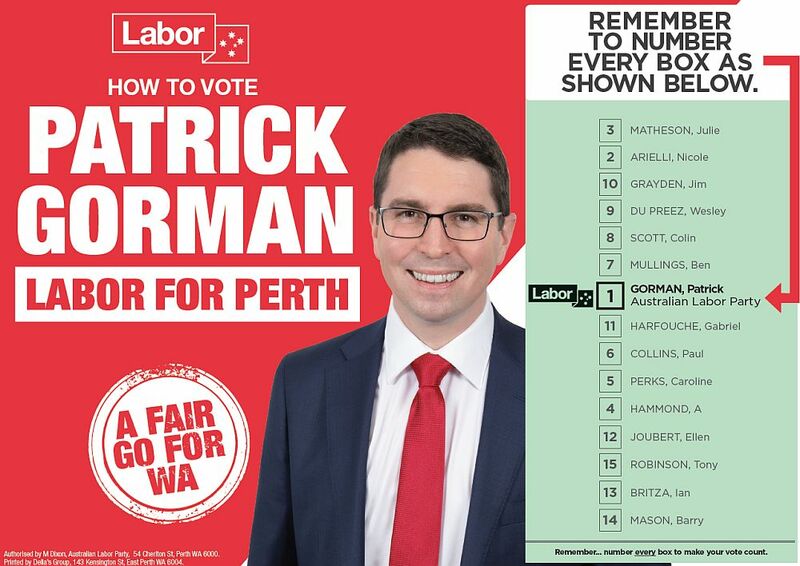 Patrick Gorman is the Western Australian State Secretary of the Labor Party and previously worked as an Advisor to Kevin Rudd during his time as Prime Minister, as well as for United Voice as its Director of Public Affairs. Caroline Perks is an expert in climate policy and is a Perth local. She worked for the Western Australian Department of Environment Regulation as a policy officer dealing with adaption for a four month period in early 2014. She also worked for the Western Australian Local Government Association for several years as Climate Change Coordinator and currently works as a Senior Sustainability Officer for the City of Perth. Dr Tony Robinson spent the first 30 years of his life in the Sydney suburb of Willoughby and attended Marist Brothers North Shore. After completing studies at University NSW, he specialised in orthopaedic surgery and continues to work as an orthopaedic surgeon. He is the co-founder of Australian Liberty Alliance. Ian Britza is a former, Two-term Liberal MP for the seat of Morley elected at the 2008 state election. He also recently contested the 2017 New England federal by-election as a Country Party candidate. Barry Mason is a keen golfer, enjoys travelling, camping, archery at his local club and spending time with his family including two grandchildren. He currently works part-time as a driver for a local traffic management company afer leaving a 30-year career in the housing industry designing and selling homes. He has lived in suburb of Rossmoyne all his life. With the Liberal Party deciding not to endorse a candidate in this by-election; Labor should retain the seat comfortably. There may, however, be a protest vote against Labor which would benefit the Greens and other minor party candidates, but it is unlikely this would be enough to prevent Labor from retaining it.